You already know the 12 Days Of Christmas, with its drummers drumming and partridges and gold rings, but we here at The A.V. Club like to take everything one step further, for your reading pleasure. Hence, 13 Days Of Christmas, a collection of essays on a handful of beloved holiday classics and a few that have sadly fallen through the cracks. Up today, the David Sedaris holiday story collection Holidays On Ice. It gets worse: He wants to be a full-time elf at Macy’s SantaLand, not an “evening and weekend” elf. The latter has more dignity; it’s just a means of picking up some extra money during the holidays. The former marks a person who has nothing else to save him from such a humiliating state. But in the early ’90s, before he became one of today’s most beloved authors and memoirists, David Sedaris had nothing else. Strangely enough, that low point was his ticket to fame and fortune. Sedaris’ journal from his time as an elf at Macy’s became “SantaLand Diaries,” an essay he read for NPR’s Morning Edition in December of 1992, and that led to more work with public radio, which led to a book deal, and all the acclaim Sedaris has since enjoyed. It was also adapted for the stage in 1996—amazingly, Timothy Olyphant originated the role—and remains a staple of local theater companies around the country. “SantaLand Diaries” anchors Holidays On Ice, a collection of Sedaris’ holiday-themed essays, both non-fiction and fiction. Although most of the stories are tied to Christmas, a few mine other holidays, such as Halloween and Easter. 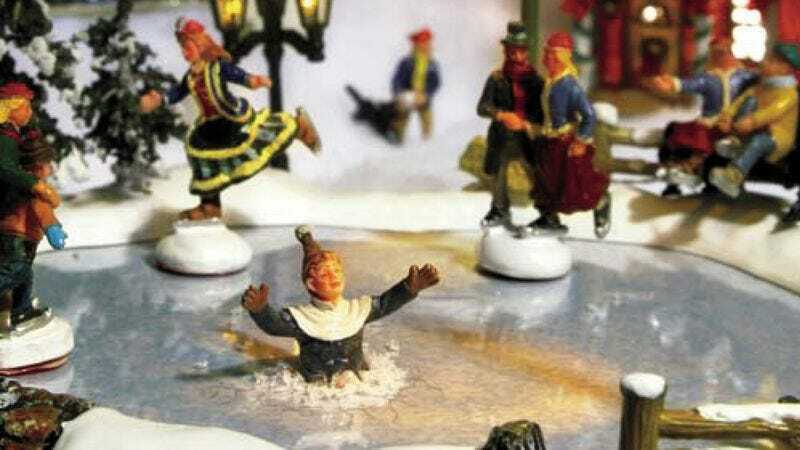 First published in 1997, the book has expanded over the years to include stories from Sedaris’ subsequent work, but “SantaLand” has always held the first spot in it. By the time Sedaris published his first collection of non-fiction essays, Naked, in 1997, he’d become skilled at putting a heart underneath his acidic wit. That collection’s “Dinah, The Christmas Whore” also appears in Holidays On Ice. In it, Sedaris’ sister Lisa drags him to a run-down part of town to rescue a prostitute she knows from her job. They bring this woman back home, where Sedaris’ mom treats her compassionately and the many Sedaris children pepper her with questions. If anyone can pull some sentiment from the absurdity of a prostitute spending a day before Christmas with his family, it’s David Sedaris. The set dressing may be R-rated, but the sentiment is decidedly G: Those kinds of moments, the ones we try to sear into our minds and hold onto forever, are the goal of the holiday season—and it can be alienating when they don’t happen (or are replaced with something much more stressful). Holiday entertainment practically fetishizes togetherness, but the wizened know it can’t be forced. Sometimes a family can bond over a prostitute. “From this moment on, the phrase ‘Ho, ho, ho’ would take on a whole different meaning; and I, along with the rest of my family, could appreciate it in our own clannish way,” Sedaris writes in “Dinah.” It’s their version of the “Chinese turkey” from the end of A Christmas Story or the millions of other inside references families share. All around the world, new family lore is written this time of year. If only David Sedaris could chronicle all of it.